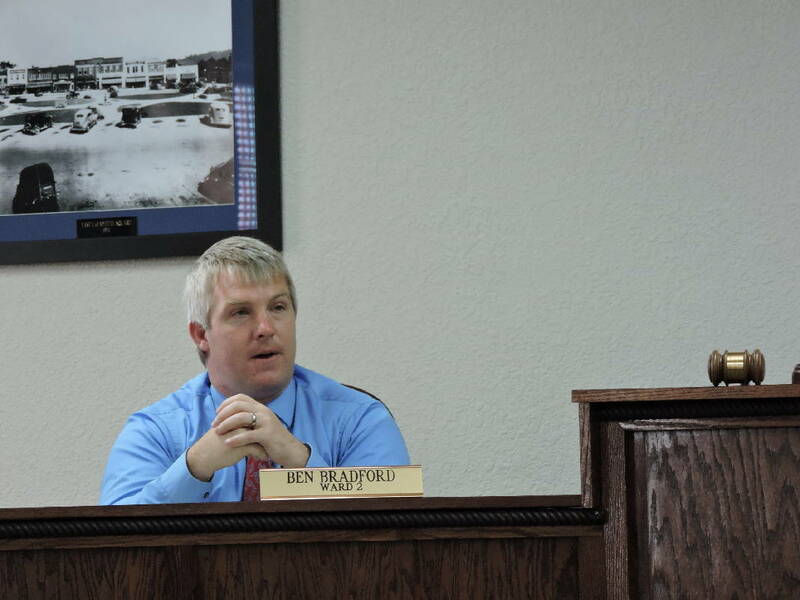 LaFayette Councilman Ben Bradford discusses city business at a recent City Council meeting. LaFayette Mayor Andy Arnold talks business at a recent LaFayette City Council meeting. *The project, which stretches from West Main and Chattanooga Street South, will repair a gas main shared with Summerville and Trion. LaFayette originally estimated its share of the cost at $60,000, but the project came in under budget, costing the city $53,200.30. *Councilman Ben Bradford said people ask him all the time when Chattanooga Street will be paved. *“It will be about availability of the paving group,” Hamilton said. *According to officials at City Hall, a paving company had not been chosen yet, nor bids solicited, though the project is set to start in early August. *To also help maintain city public works, the city is purchasing a spare submersible 6-inch, three-stage industrial grade pump with a 50-horsepower motor for the Lee School Road Water Treatment Plant Well. It will be used if and when the current pump and motor fails. *The City Council unanimously approved the National Water Services $12,488 bid on the project. Movies in the Park is Saturday, July 16 at sundown or 9 p.m. and features “Minions” at Joe Stock Park. Everyone is invited to attend, and the movie is free. Refreshments and popcorn will be available for purchase. The next LaFayette City Council meeting is Tuesday, July 19 at 6:30 p.m. The next LaFayette Downtown Development meeting is July 20 at noon at the LaFayette Municipal Golf Course Clubhouse. The city of LaFayette is in the process of cleaning up blighted properties in the city. "We started with a goal of cleaning up at least 36 properties by March 31, 2016," said LaFayette Economic Development Director and Main Street Manager Kevin Dunn, referencing a Neighborhood Revitalization and Restoration Initiative launched in January. "We achieved that goal, and in almost all cases, through residents and property owners themselves wanting to do their part in improving the city and cleaning up and or eliminating properties they owned that did not conform to city ordinances and codes. "In many cases, folks just needed to be educated about the ordinances and that codes and compliance is for the safety, health and best interest of all residents," said Dunn, referring to the blighted properties. Sixteen additional properties are being actively improved by cleanup and or demo, and three more blighted properties were demolished and cleared by owner action in June, according to a city report. "Sixteen properties are in an improvement plan with codes," said City Councilman Ben Bradford. "Two properties went to court yesterday. Once they go to court it's up to the city to enforce codes." Five more properties are headed to court process and judgment, according to the city report. "The initiative's goal is to eliminate unsightly visuals and landscape in the city of LaFayette," Dunn said. - Improve the neighborhoods and the visual landscape while traveling through the city. - Clean up trash and clutter on properties, eliminate blight, rehabilitate problem structures and clean up vacant lots. "The initiative has been very successful, as visuals in the city have improved and owners have even demolished blighted properties that they acknowledged they should have done a long time ago," said Dunn. "In many cases, there are now clean, empty lots ready for new vision and redevelopment. Many residents and visitors have commented that the city is beginning to look better and even 'feel' better." According to Dunn, "blighted property" is generally defined as any property that endangers the public health or safety in its condition; is a public nuisance; or an individual commercial, industrial or residential structure or improvement that is beyond repair or unfit for human occupancy or use. 1. Properties that need cleaning up of the trash and stash. 2. Properties in need of significant repair and maintenance. 3. Properties that are likely beyond restoration and are in need of redevelopment or re-creation. 4. Properties that are blighted by pure definition. "By May, we had identified around 85 properties to work with owners on that fit in one of the four categories above, and to date, owners or residents have cleaned up and repaired many," Dunn said. "A few of the blighted properties became such due to crime — specifically arson — in that they were properties that fell into one of the 1, 2 or 3 categories above in the past and were left that way for too long a time and set on fire by arson and became fully blighted."